Following up from yesterday’s “seven” ancient images of Turkey – we are now spending today’s post on talking a little bit about them. We mean no disrespect to history or the ruins of Turkey but too much of a good thing can sometimes be bad. 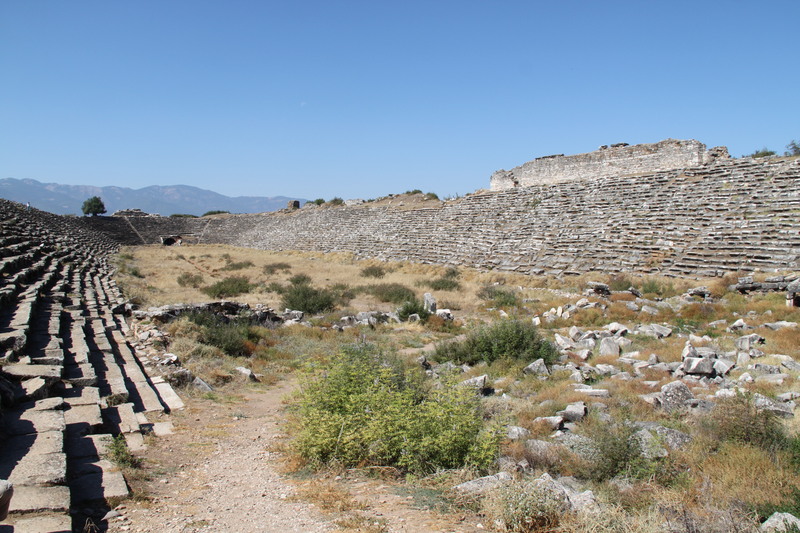 The first site of ruins that we saw was exciting, the second site was mind-boggling, the third site still brought awe but then by the fourth and those thereafter honestly became a bit of a blur. But it wasn’t only here that we have experienced this form of saturation or sightseeing fatigue, this has happened to us in several parts of the world. In Europe, there were castles/palaces, cathedrals and churches! And our times in Asia, we have experienced temples saturation. We’ve suffered museum and art gallery fatigue too! Everything begins to blend into one. We tried slow travel and we’ve tried intense travel but it always happens! We have learnt that variety is key. 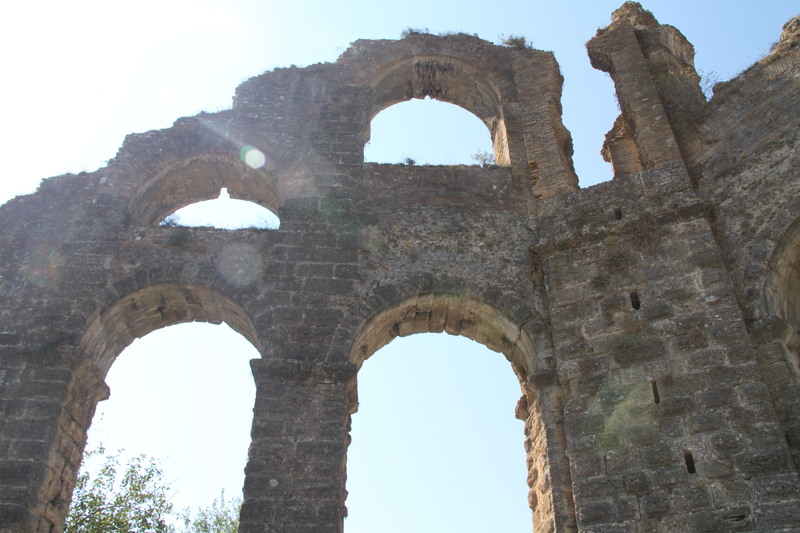 But back to Turkey, we did see amazing ruins! Please don’t get us wrong, there is no denying the significance of the things we saw. 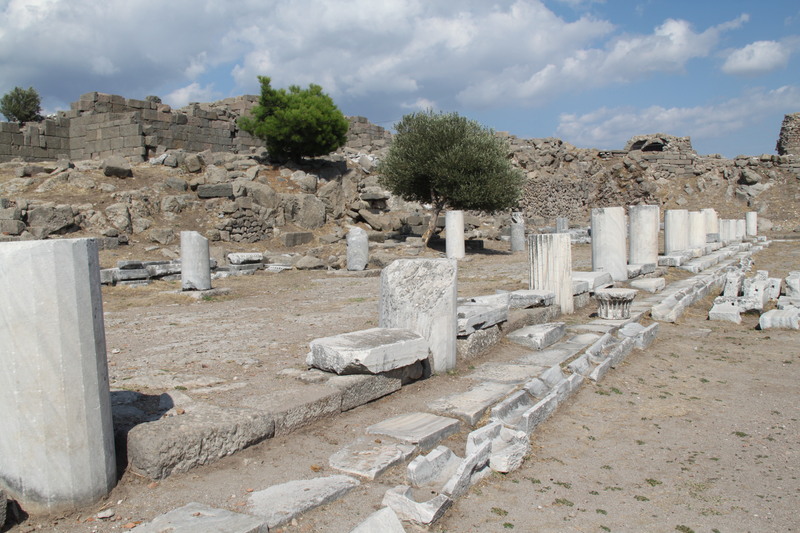 We love history, especially ancient history and we loved what we saw! It is highly likely that this place needs no introduction. History buffs will know the city of Troy and those that don’t, may have at least seen the movie with Brad Pitt and Eric Bana. 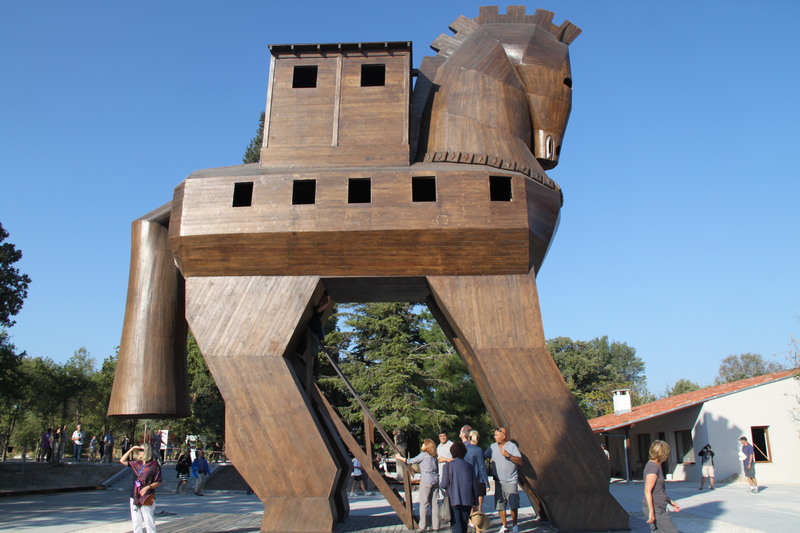 If you still have no idea what we are talking about, then maybe you know the legendary tale how Troy came to be conquered by the Greeks in the wooden horse! This site is probably underwhelming in some respects but we were still excited. As we walked through the clearly marked path, we tried to grasp the size of the walled city. It definitely isn’t big by today’s standards but we knew they were not penetrable. It blew us away how the city wall we could see was only part of it, the height was much taller and the rest was still buried beneath where we stood. And of course, we needed to do the typical tourist thing, climb inside the horse and have our photos taken. Not the original Trojan Horse, now that would’ve been exciting! The most impressive Temple of Zeus altar was discovered here however unfortunately today there is nothing more than rubble. The altar have been excavated and taken back and reconstructed in a museum in Berlin – which is a shame but in terms of preservation, probably for its own good. 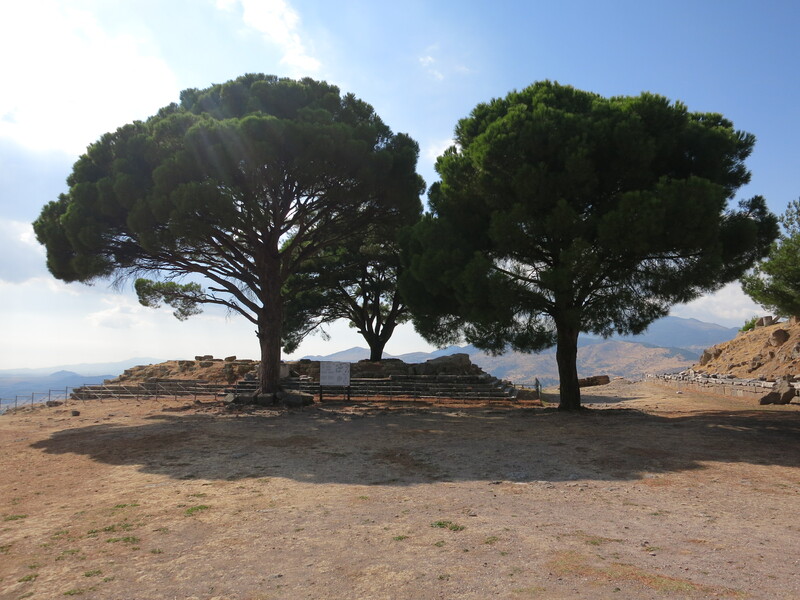 What we loved about this ancient ruins site, aside the fact you travel on a cable car up to it, is the gorgeous amphitheatre! Looking at our photos now still provides this overwhelming feeling of can’t-believe-we-saw-that. It’s so steep and its sheer size astounds us still. This place is definitely worth a visit. We really enjoyed it here. 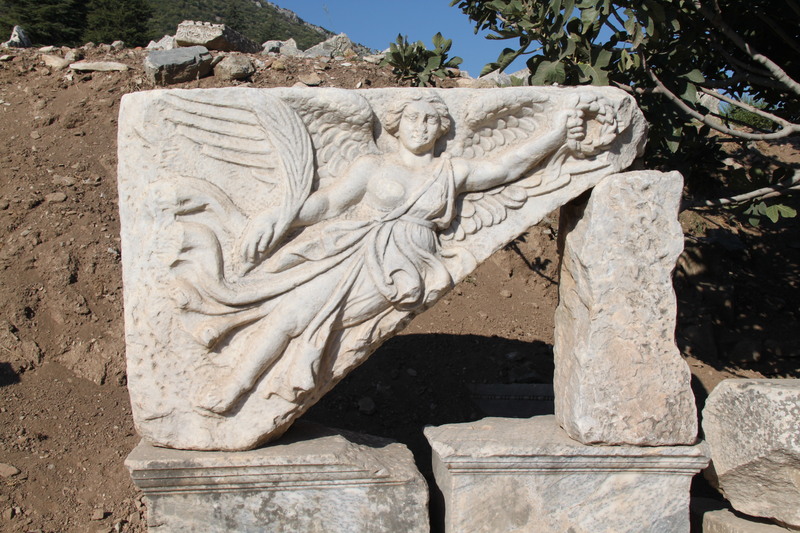 Ephesus is probably most famous for the Library of Celsus and Gate of Augustus. Hate to break it to you, but is all reconstructed with replicas. The originals can be found in Vienna. Sometimes, we wish we didn’t know any better. Anyway, it didn’t bother us much as we found some other things rather fascinating while here; the mosaics on the paths outside the terraces, the public washrooms, the Fountain of Trajan, the Goddess Nike carving and one of us being from a health background was quite humbled to see the medical and pharmacy symbols. Entering the gladiator arena was also probably a wee bit exciting! 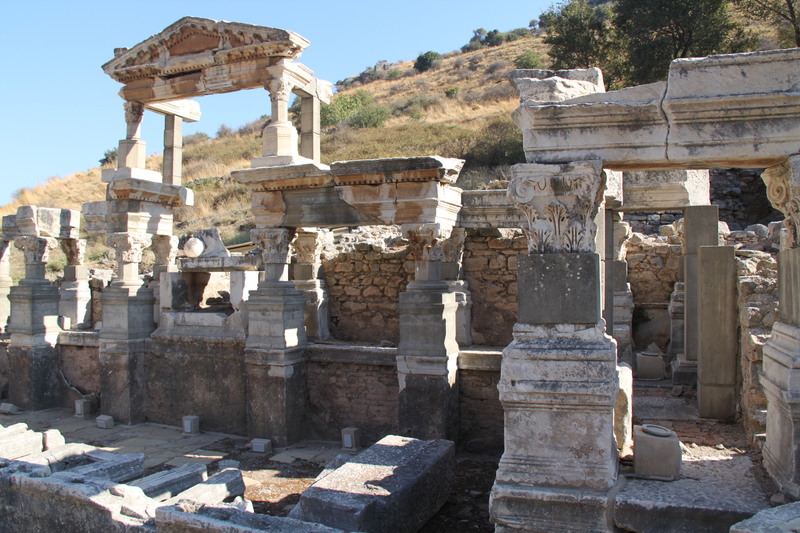 Ephesus is not far from Kusadasi or Izmir which are ports for cruises. So if you happen to be here when the boats are in, expect to have thousands of other fellow visitors. Although what we saw here was magnificent and mind blowing, it was also extremely crowded. A bit of a mixed bag this place for us. There was the Sebasteion and the tetrapylon which were both reconstructed. So the stadium was our biggest highlight here. It is about 2 football fields long (260 m) and would have been able to house up to 30, 000 spectators. 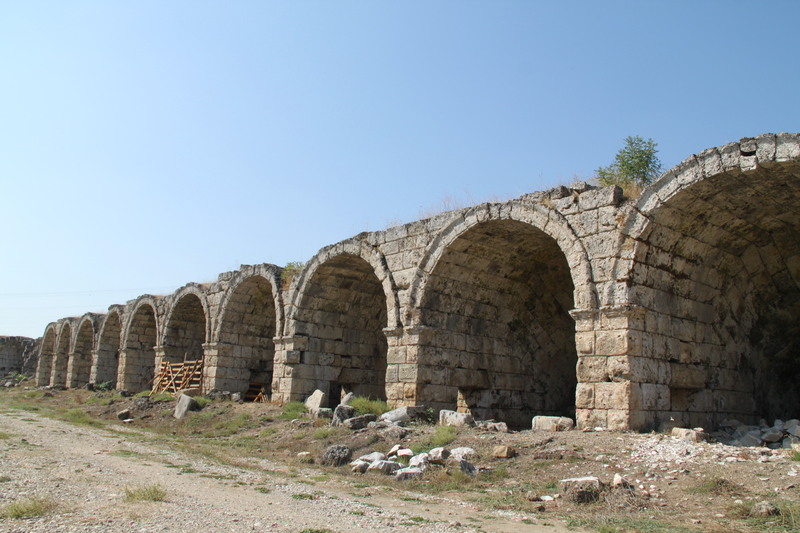 It is said that it is one of the best preserved ancient stadiums. There is an air-conditioned museum which houses all the statues and artefacts found at the site. It is a lovely refuge on a hot day but also very interesting to explore the different exhibits! Seeing the old baths was probably the most fascinating thing here. 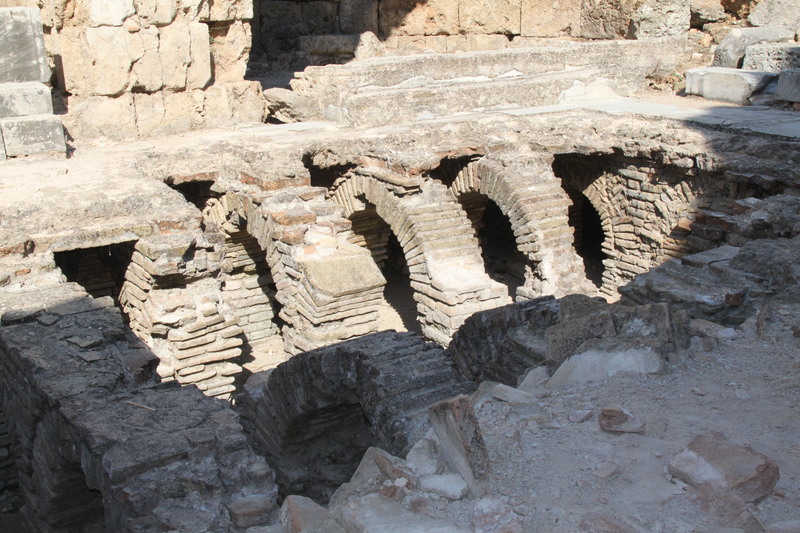 Firstly there was a water pipe system and that there were visible heating facilities (hypocaust chambers) underground. 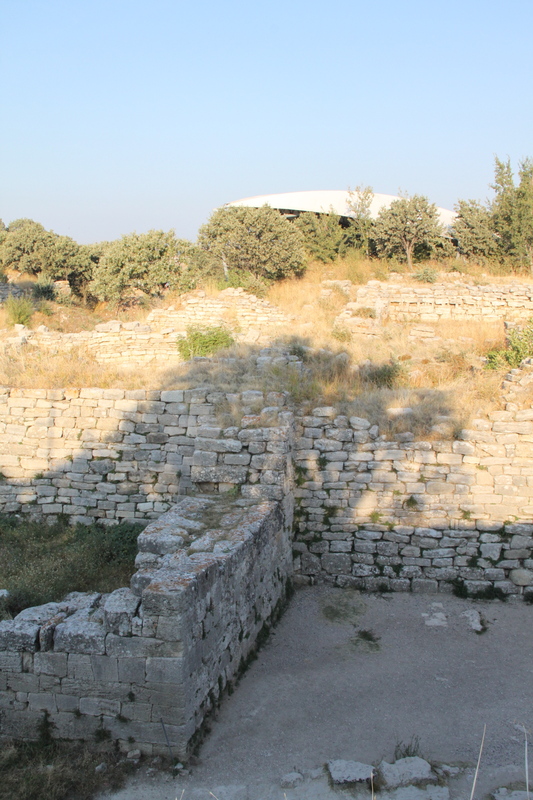 Perge also has a stadium outside of the entrance gates which is believed could house 12, 000 spectators. It is noticeable from our photos that our interest here has waned a lot. The heat was probably also getting to us. We don’t have very many photos of this particular area. 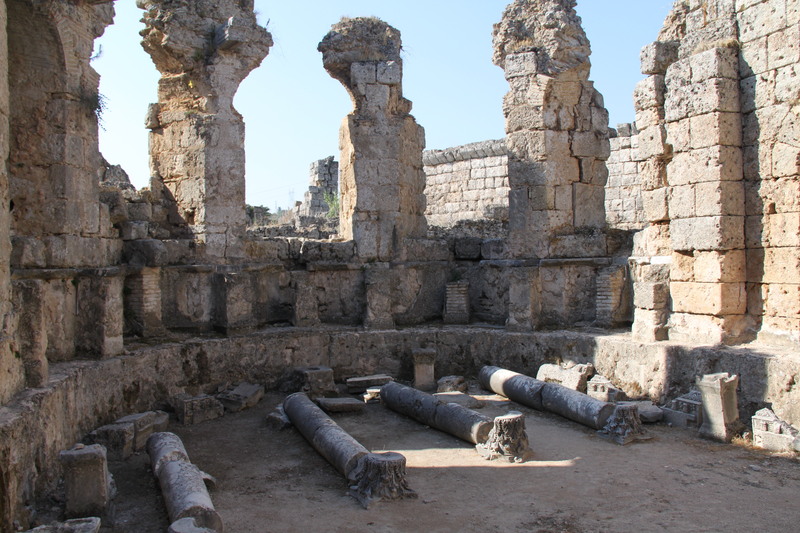 We have a few of the very well-preserved theatre and a few of the aqueducts. What actually fascinated us most about this area were the cotton fields. Being born and raised in the city, we had never seen how cotton was grown other than on TV and in books. So to see it in “real life” was our highlight here! 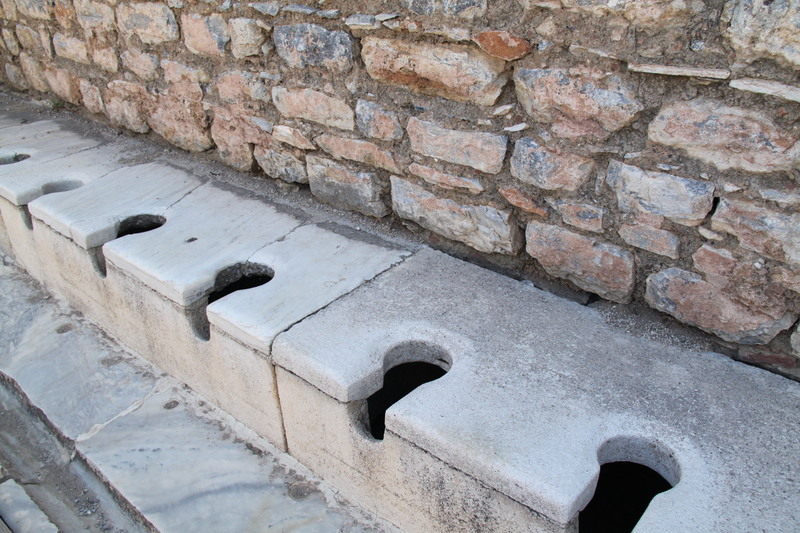 Despite possibly feeling a little weary of ruins, there is one thing we always do when we visit historical sites. 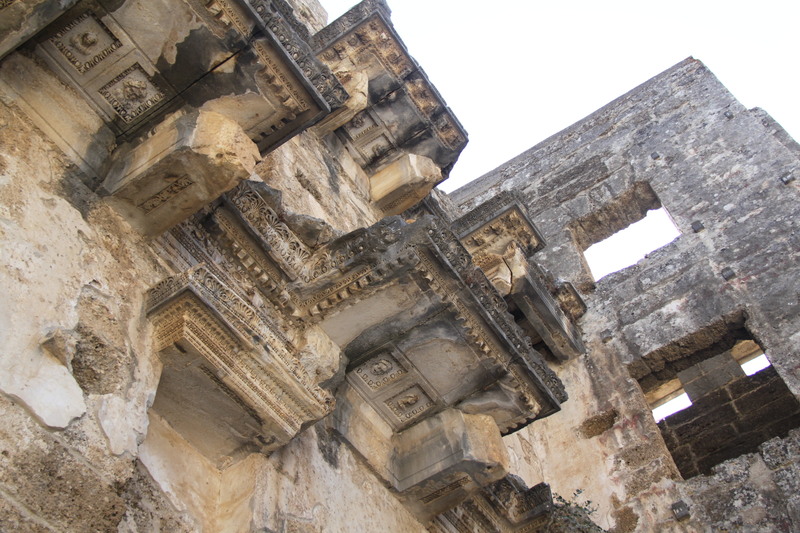 We pause and try to imagine what life would have been like in the times when the ruins were not ruins. In our heads, we try to recreate the sounds we might be hearing, the atmosphere. We will never know if we get it right but it’s still our way of soaking it all in so we remember it the way we choose to remember it. 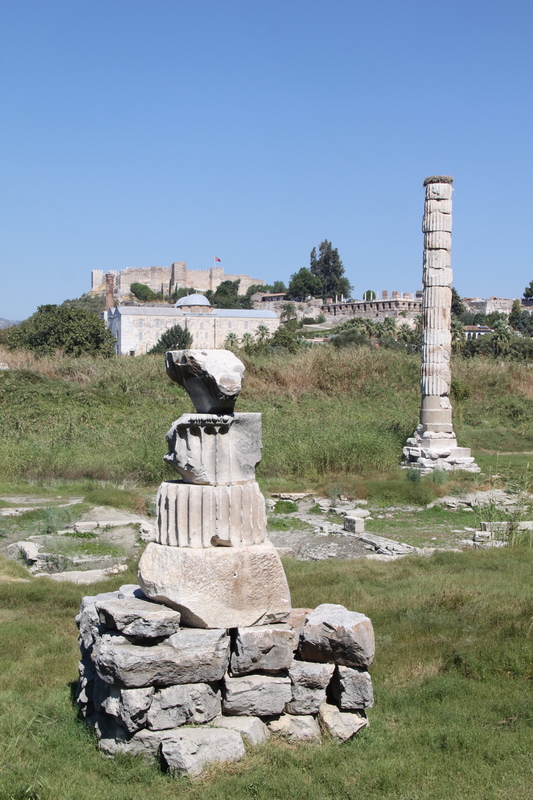 This entry was posted in Turkey and tagged ancient ruins, Architecture, Asia, Aspendos, castles, churches, Ephesus, gladiators, history, Library of Celsus, Perge, Temple of Artemis, Travel, Troy, Turkey. 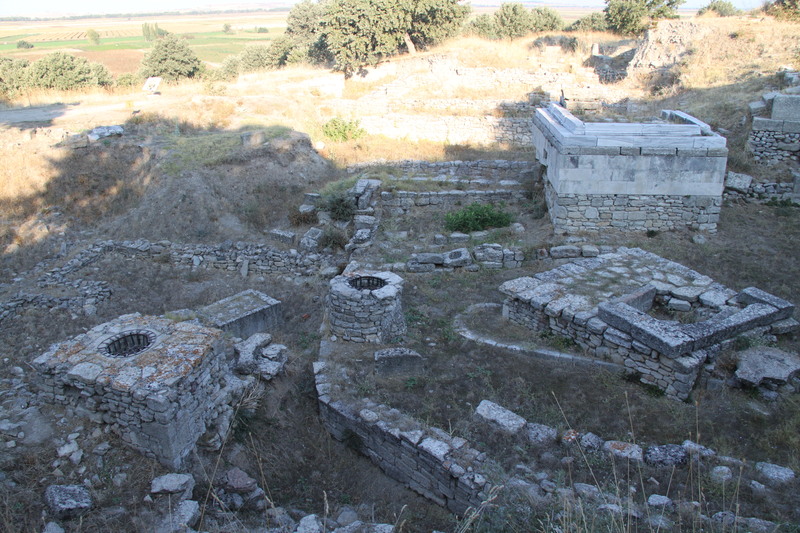 Today’s Daily Prompt is : SEVEN – so we are taking the opportunity to visually introduce you to 7 different ancient ruins that we visited in Turkey. In tomorrow’s post, we will write about our experiences with the “seven” of them. 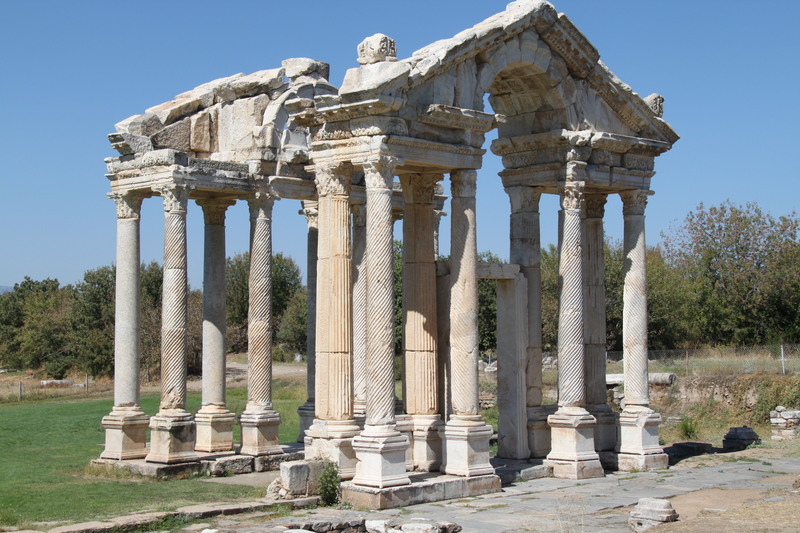 This entry was posted in Turkey, Turkey and tagged ancient ruins, Aphrodisias, Aspendos, Ephesus, history, Pergamon, Perge, Travel, Troy, Turkey. So our excitement to go to Africa has been stunted by nothing other than us. Due to a multitude of reasons and factors, we have decided to postpone this trip and instead venture elsewhere. It was a toss up between several countries and Turkey has beat the rest. However, about two days after locking it in, the riots began in Turkey. Oh no! We do know a few people who know people who are over there travelling now. Hopefully by September, it is calmer. Well, it has to be okay, everything is locked in and paid for. According to smarttraveller.gov at present it is stating “Exercise a high degree of caution” – which was what Peru was on when we were there. Guess it is comforting that its not on “Reconsider your need to travel”. We’ll just have to wait and see how it all unravels. The countdown can officially begin now that we are only a little over 2 months out! And fortunately as per our travel philosophy, Tasmania for January is now booked so we can breathe easier that we have the next adventure booked. Although we have visited Tasmania before, it is a place that we enjoyed so much and would not hesitate going back to! 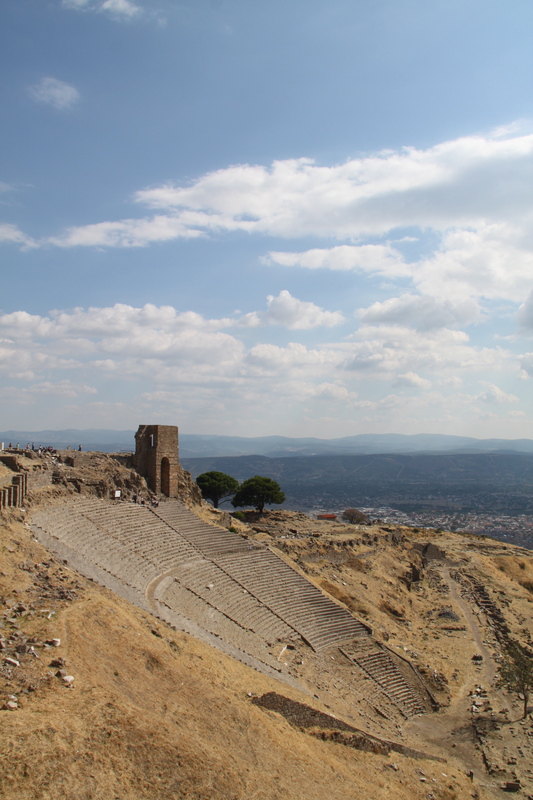 This entry was posted in Turkey and tagged Antalya, Aspendos, Fethiye, Hierapolis, Pamukkale, Turkey.